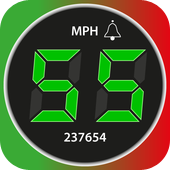 Blocoware iPhone and iPad Apps: Speedometer - Can't stop myself from sharing this! iOS7 design + longer detailed tracks and WAYPOINTS! I wanted to keep this for closer before the release. But just redesigning few places in speedometer for iOS7 and the following screen looked so gorgeous that I wanted to share ASAP! Whatever is my feeling for iOS7 generally (I have already all animations switched off etc...), I believe in black style it is making much better partner to the speedometer app than iOS < 7 were doing it. But look, the track is 765 kilometers long (and still opens within a second)! And did you notice those waypoints along the track?! Yep, the detailed tracking number of points will be increased to be twice as what it used to be (should be now enough for around 16 hours per single track with built in GPS). And waypoints deserve a separate article closer to the release, they are definitely not just the mute points! Take care on the roads and let speedometer app help you with that!